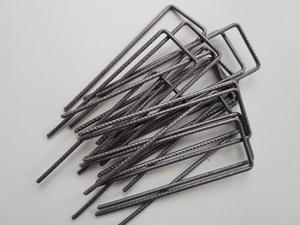 We recommend 50 steel U-pins per roll for Turf Reinforcement Mesh 1m x 10m rolls. 1m x 10m roll of light-duty plastic mesh ideal for protecting lawns from dogs and pets digging and reinforcing grass areas prone to wear and rutting. Turf reinforcement mesh is fixed to the grass using metal pins. As the grass grows through the plastic mesh holes, the grass roots interlink with the mesh filaments creating a stable surface that helps to protect grass from wear. If installed correctly, the mesh spreads the weight of people, cars and other vehicles on grass. Installation can be carried out all year round. If installed in the spring and summer grass growing seasons, the reinforced grass can be used within just a few weeks when the grass has grown a good thatch through the mesh - creating a strong mesh to root entanglement. The mesh should be fixed a minimum every 50cm using steel u-pins supplied by Ultimate One Ltd.The grass can be mown as soon as it is through the mesh, but it is best to set mower blades slightly high in case not all the mesh and pins are sitting flush with the ground.